The artiste has further said he can't wait to have his day court in the case filed against him by one of his baby mamas. Early this week, a woman by the name Hadija Hassan sued the musician in a Dar es Salaam court accusing him of being a dead beat father to their 5 year old daughter since the beginning of this year. In her claims, which were published by Nipashe newspaper, Hadija accused Alikiba of contravening Tanzania Children's Act 2009 which spells out the kind of child support she is entitled to. The woman, who claims she earns a living through the sale of second hand clothes, further asked the court to compel the artiste to pay a total of Tsh1.3 Million (Sh56,500) for the child's monthly upkeep as well as the 'arrears' of the months accrued since he stopped remitting the money. However, reacting to the news for the first time, Alikiba confirmed that indeed he had stopped supporting her daughter because the mother made it difficult for him to continue playing his role as a father. As a result, he says he has welcomed the move to be taken to court where he hopes present his defence. "Nilichokuwa nataka mimi ifike huko ilipofika (mahakamani). Kwa sababu haiwezekani kama kumuhudumia mimi nilikuwa namhudumia tena vizuri tu, mtoto nimemtoa kwenye shule aliyokuwa akisoma nimempeleka kwenye shule ya gharama zaidi ya mara tatu ya ile aliyokuwa akisoma. Sijaelewa lengo lake ni nini," Alikiba said during a radio interview on Friday. The artiste further claimed that Hadija has always opposed the idea of their daughter spending time with him and his family. "Hiyo ishu ipo, of course kwenye ustawi wa jamii, na yote mikasa ilitokana na jinsi yule mama (Hadija) alitunyanyasa sisi sote familia yetu jinsi ya kukaa na mtoto na kumuona. Kwa sababu mtoto anatamani kumuona baba yake basi labda unamwambia kwa leo Ijumaa mlete aje kukaa huku hadi Jumapili anarudi kwa ajili ya shule Jumatatu. Lakini tukimchukua Ijumaa hiyo hiyo au Jumamosi anakuja kumchukua eti anam-miss. Sikuwa namuelewa," he said. 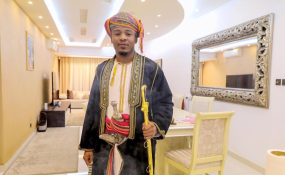 All these developments have come just days after the artiste tied the knot with his Kenyan spouse, Amina Khaleef, in two colourful events in Mombasa and Dar es Salaam. The newly-weds have planned to go to Venice, Italy for their honeymoon.